Grab your kicks and join us for a gallery hop! 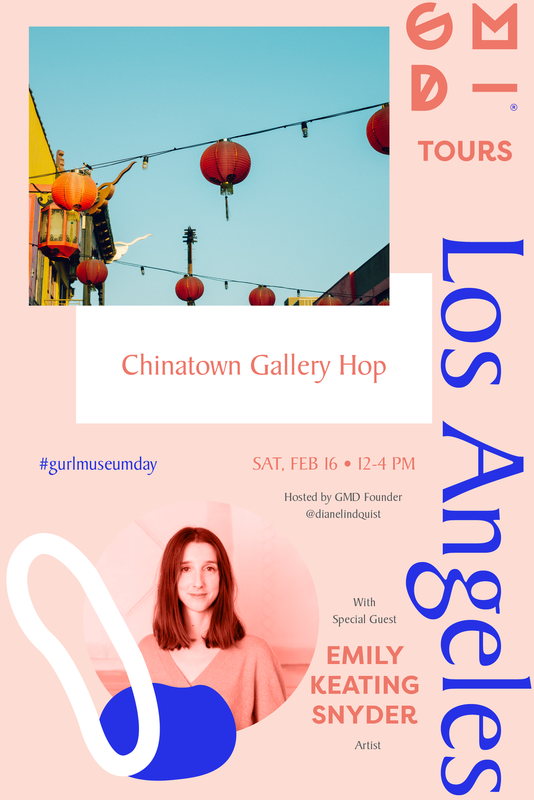 For February’s GMD Los Angeles Tour, we’re heading to visit the trendy galleries and walk through the iconic Chinatown. We will begin by meeting in front of Make Room LA gallery. Afterwards we will continue to walk towards 5 remaining galleries to visit that day. We will be walking about 0.5 miles. We highly recommend that you come with a water bottle and good walking shoes. This month’s special guest is gurl artist, Emily Keating Snyder. Everyone attending will receive an official GMD button! This month's tour requires a pay admission fee of $20. Register via Eventbrite. Please note that all sales are final, there will be no refunds. Sorry gurls. This event will take place rain or shine. Emily Keating Snyder is a Los Angeles-based mixed media artist. Her ongoing painting series seeks to create immersive color with uninterrupted expanses of solid paint enhanced by inlaid thread. A crafter and tinkerer at heart, Emily brings the hands-on materiality of folk art to the more intellectualized space of fine art. Her work has been featured by Saatchi Art, designlovefest, and SF Girl By Bay. We’ll meet in the front entrance of the Make Room LA gallery. Find GMD’s founder Diane Lindquist waiting to meet y'all. There you will briefly introduce yourself, describe what you are passionate about, and your current art obsession before we proceed to our gallery hop. Between hopping to these galleries we be walking through the iconic Chinatown, stopping by where you can capture the best Instagram shots and checking out art murals along the way!. GMD Founder is a expert Instagramer, feel free to ask her to take a picture! We will be walking about 0.5 miles. We highly recommend that you come with a water bottle and good walking shoes. Everyone attending will receive an official GMD button! #GURLMusuemDay, official hashtag. At this time we will briefly have announcements of upcoming gatherings and you will have the option to join GMD Founder Diane Lindquist for a cup of coffee. This is totally optional but if you like to connect with GMD Founder and the rest of the gurls on your tour, you can join us as we walked to near by coffee shop for a cup a joe. We strongly recommend you take public transportation of Lyft to location and parking is be limited. There is free street parking as well as meter parking. Selected locations have paid parking garages are nearby.